Fig. 7. Structure of TMH3 in the 5-HT1A receptor (yellow) compared with rhodopsin (grey). 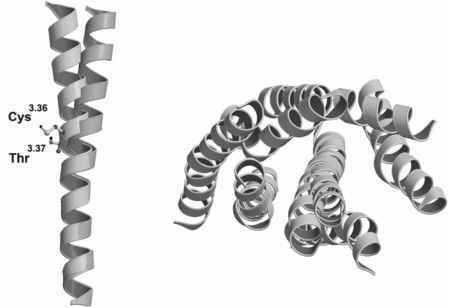 The left panel shows how the presence of Cys3.36 and Thr3.37 conserved in the amine receptor family of class A GPCRs (59 and 80%, respectively) induces a bend in the helix. The effect of this bend relative to the transmembrane bundle, viewed from the extracellular side, is shown in the right panel. Fig. 8. Rotation of Ser and Thr side-chain can induce different conformation of the helix. In this figure, the red helix represents an ideal (non bent) a-helix, taken as a reference. Rotation of Ser side-chain from gauche- (blue) to the trans- (green) conformation induces a change in the direction of the helix toward different locations. ligands (52). Interestingly, amine receptors also have a highly conserved Cys residue at position 3.44; the structural and/or functional role of this Cys residue has not been elucidated but may be involved in selecting specific helical conformations, as proposed for Ser and Thr residues. Additionally, there is indirect experimental evidence for a structural role of Ser residues in TMH5. Conserved Ser5.42 (53), Ser5.43 (53), and Ser5.46 (54) have been shown to be involved in ligand recognition, interacting with the hydroxyl groups of the catechol moiety in catecholamines. Also, Ser2045.42 and Ser2055.43 of the P2-AR modulates the equilibrium between the active and inactive form of the receptor (55). We suggest that these Ser adopt the gauche- conformation in the absence of the extracellular ligand, thus satisfying its hydrogen bonding potential through interactions with the backbone car-bonyls. During ligand binding, Ser must adopt the trans-conformation to optimally interact with the hydroxyl moieties of the ligand. This transition ultimately leads to an alteration of the orientation of the helix toward different positions in space (Fig. 8), which can be related to the transition toward an active form of the receptor. Notably, the presence of several Ser or Thr resi dues conserved within the same turn of TMH5 at 5.42, 5.43, and 5.46 may result in a much larger degree of conformational plasticity because of syner-gistic helical distortions, as shown for the D2 dopamine receptor (18). Although the role of other conserved Ser of the amine receptor family is not clear, some studies point to a role in the structure or function of these receptors. Substituted Cys accessibility method (SCAM) experiments in the D2 dopamine receptor (56) show that Ser1213.39 faces a water-accessible crevice. According to models based on the crystal structure of rhodopsin (31,52), this residue would be facing Asn7.49 and Asp2.50, which are highly conserved in the whole class A family and are involved in receptor activation (57). In this region, the most recent crystal structures of bovine rhodop-sin (PDB access codes 1L9H and 1GZM) show the presence of water molecules (58). Interestingly, bovine rhodopsin features an Ala residue at position 3.39. Therefore, one can suggest that in the amine receptor family, the polar side-chain of Ser3.39 replaces the function of one of these water molecules. Mutations of Ser1213.39 in the D2 dopamine receptor (59) and of Ser1093.39 in acetylcholine receptor (60) appear to destabilize the active state of the receptors, likely by disruption of this hydrogen bond network that results from the loss of the polar Ser3.39. A similar role has been proposed for Ser7.46 based on mutagenesis studies on the acetylcholine receptor. This position, which is likely to be near Asn7.49 and Asp2.50, has been proposed to be involved in a network of interactions stabilizing the active state of the receptor (61). Finally, some of these conserved Ser and Thr may be involved in maintaining the local structure of certain regions in the transmembrane bundle through specific helix-helix interactions. For example, Ser2.45 of amine receptors is believed to interact with the nearby Trp4.50 (which is highly conserved in all class A GPCRs) through a hydrogen bond interaction; a similar pattern is present in rhodopsin, where position 2.45 holds an Asn residue. However, single Ser and Thr residues are not able to promote helix-helix association. Motifs of multiple Ser and/or Thr are needed to create a network of hydrogen bonds that is strong enough to promote association (62). In summary, we hypothesize that Ser and Thr residues can affect the structure of the transmembrane bundle, conferring some degree of plasticity to the receptor. Dynamically, these motifs also provide flexibility to the structure, because changes in the conformation of the side-chain can modulate the deformation of TMHs. Such changes in side-chain conformation could be triggered either by changes in the protonation state or conformation of nearby side-chains or by ligand binding. Combinations of Ser/Thr and Pro residues found in the transmembrane bundle of GPCRs tend to be conserved within specific subfamilies (see Table 3). For example, the Thr2.56-X-Pro2.58 motif in TMH2 is present in leukotriene B4, platelet activating factor, and viral and peptide receptors. In the latter subfamily, it is highly conserved in the APJ-like, angiotensin, chemokine, Fmet-leu-phe, interleukin-8 and opioid receptors subfamilies, accounting for almost 50% of the entire peptide receptor subgroup. Interestingly, in the corresponding position of the sequence, opsin receptors possess Gly892.56-Gly902.57, a highly conserved motif (90%) in rhodopsin vertebrate type 1 receptors. Although both the Thr2.56-X-Pro2.58 and the Gly2.56-Gly2.57 motifs are able to induce a distortion in the a-helix, these motifs are likely to bend TMH2 in different directions, thereby producing a different local structure in this region (Fig. 9). 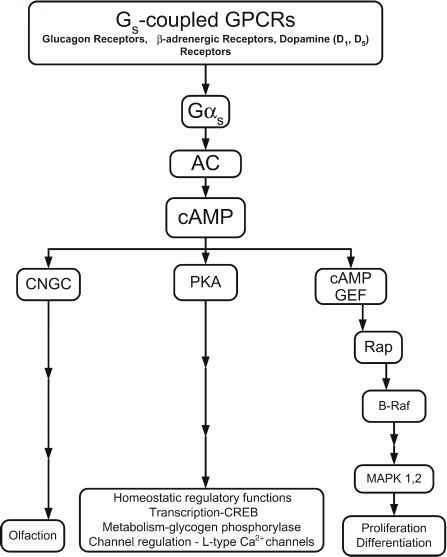 Hence, the structural consequences of this sequence motif are expected to be a structural determinant of at least some of the listed families, thus accounting for specificities in the structure and/or function among GPCRs. Fig. 9. Structure of TMH2 in the CCR5 receptor (orange) compared with rhodop-sin (grey). The left panel shows how the presence of the Thr822.56-X-Pro842.58 (highly conserved in some peptide receptor families) forces the helix to point in a different direction. The magnitude of this effect relative to the transmembrane bundle, viewed from the extracellular side, is shown in the right panel. ture. This pattern of interaction has been further experimentally tested for the CCR5 receptor (63). These results lead us to suggest that the Thr822.56-X-Pro842.58 motif in TMH2 is a structural determinant in the chemokine-and possibly other peptide-receptor family by virtue of significant local effects on the helix conformation, which propagate through a lever action to the extracellular parts of the transmembrane bundle. Fig. 10. 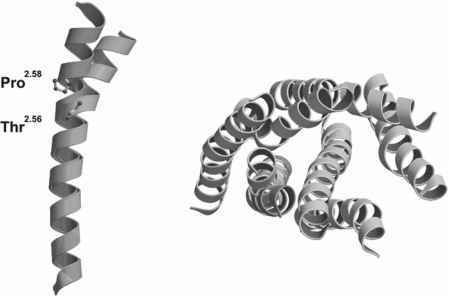 Conformational plasticity of GPCRs. The figures represent two different orientations (rotated 180°) of the transmembrane bundle viewed from the extracellular side. The rhodopsin template is represented by thick ribbons, whereas possible alternative conformations for each helix are represented by thin ribbons. This alternative conformations arise from different conformations of selected sequence patterns: a Ser1.46-X-Pro1.48 motif (conserved in adenosine type 1 receptors); a Ser2.56-X-Pro2.58 motif, with Ser in gauche- and gauche+ conformations (conserved in some peptide receptor families); Ser3.30 (conserved in histamine, some serotonin and p2-ARs) and a Cys3.36-Thr3.37 motif (conserved in amine receptors); a Ser4.59-X-Pro4.61 motif, with Ser in gauche- and gauche+ conformations (conserved in some peptide receptor families); Ser5.43 and Ser5.46 (conserved in amine receptors); and different conformations of the Pro-kink for Pro6.50 and Pro 7.50. It can be observed how these sequence motifs are able to account for either static structural plasticity or dynamic flexibility of the transmembrane bundle, which can be related, respectively, to ligand recognition and activation mechanisms. To help visualize the location of the binding crevice, retinal is represented in spacefilling spheres. Color code: TMH1, grey; TMH2, orange; TMH3, yellow; TMH4, dark blue; TMH5, light blue; TMH6, red; TMH7, green.1X is any nonpolar residue, with the exception of Pro. In the simulations, Ala was used. states (30). In bacteriorhodopsin, mutation of Thr90 to Ala in the Thr90-Pro91 motif present in TMH C alters the proton pumping efficiency, suggesting that Thr90 also plays an important structural role in the proton pumping mechanism (64).